Duncan Leung was introduced to Wing Chun Kung Fu by his childhood friend, famed screen star Bruce Lee. At the age of 13, after the ritual of ‘three kneels, nine kowtows’ in the traditional Sifu worship ceremony, he became the formal disciple of sixth–generation Wing Chun master Yip Man. Between 1955 and 1959 he studied with his Sifu at home, where Yip taught him how to apply Wing Chun to actual fighting. Leung trained six hours a day, seven days a week for four years, and used this knowledge fighting in the streets and martial arts studios of Hong Kong. In 1964 Leung befriended an old man who taught him rare secrets of close fighting, including the art of disarming a knife-wielding opponent, and silencing an opponent barehanded. When he opened his Wing Chun studio in New York City in 1974, he was challenged by martial art practitioners of every school but remained undefeated. Since moving to Virginia Beach in 1976, he has taught US Navy SEALs, members of the FBI, and various SWAT teams. In 2002 he accepted perhaps the greatest challenge of his life: to train six Chinese teenagers to become world-class professional fighters within two years. To this end, he returned to China to accomplish what many considered an impossible mission. “The story of Duncan Leung — childhood friend of Bruce Lee and disciple of Wing Chun master Yip Man — is valuable not only for the insights it offers into Chinese martial arts but also for its portrayal of the lost Hong Kong of the 1950s and 1960s. Reading Wing Chun Warrior, which chronicles Leung’s Kung Fu escapades, will be a jarring revelation to anyone familiar with the manic but orderly and largely peaceful city of seven million people that is Hong Kong today. The city described by Ing is a place where Kung Fu practitioners wielded eight-chop knives in the streets and literally battled their way from one martial arts studio to another to prove their fighting prowess. 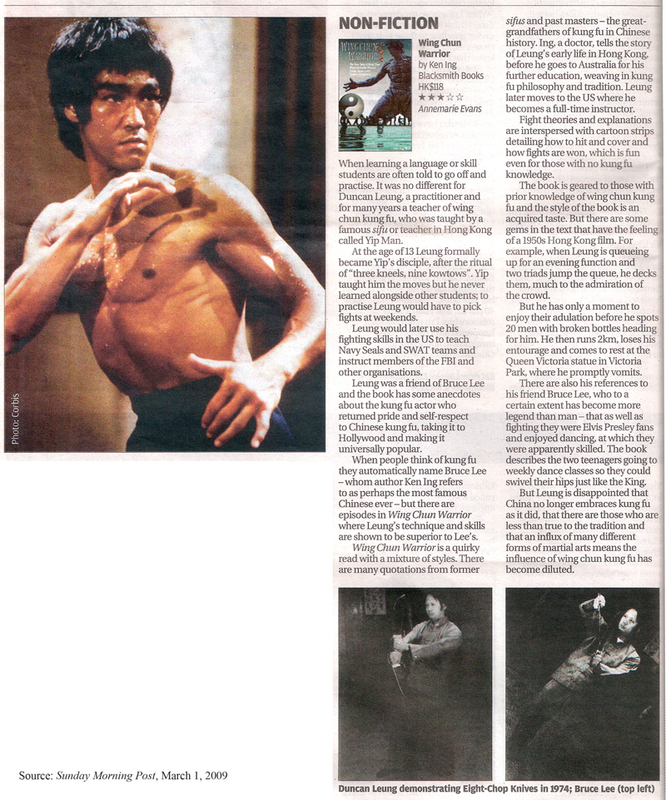 … As Ing tells the story, Bruce Lee may have been Yip Man’s most famous pupil, but Leung underwent more intensive training with the great man — four years of daily private lessons that started in 1955, when Leung was 13. During this time, Leung virtually forgot about regular schooling and devoted himself to learning Wing Chun from the master, training six hours a day, seven days a week. How did a mere boy command the daily individual attention of the world’s greatest Wing Chun sifu? It was all thanks to his gullible mother, who agreed to give her son HK$300 (US$39) a month for “private tuition” with no questions asked. That was a lot of money in the 1950s, but Leung came from a well-to-do family that tended to indulge him. So while regular students paid Yip Man HK$8 a month, Leung gave his teacher nearly twice the salary of high school graduates employed by the Hong Kong government at the time. According to Leung, Yip was keen to take the money to support his opium addiction. Author Ken Ing talked to RTHK Radio 3’s Sarah Passmore about the stories contained in Wing Chun Warrior and the state of Wing Chun kung fu today. Listen in at the online programme archive, date: 2009-03-02, from 19 minutes in. Ken Ing, M.D., graduated from the Middlesex Hospital Medical School, University of London, in 1970, practised in Canada and Hong Kong, and retired in 1997. He was introduced to Duncan Leung in 1999, unaware that he was meeting a master of Wing Chun Kung Fu. It was only a couple of years later that the author discovered the warrior’s real background, at which point his dream of assisting in the transmission of this martial art to future generations was born. After learning Tu Na from a recluse in 2004, Ken was introduced to Zhu He-ting, the revered master of the breathing art, who encouraged him to prove scientifically that practising this simple natural form of breathing is beneficial to health. Ken also translated Bypassing Bypass Surgery by Elmer M. Cranton, M.D. into the Chinese language.